This house is a bit of a landmark on US 17, north of Brunswick. I notice it every time I drive past it, because it seems so out of place. Its condition is rapidly deteriorating. It appears to have been built in the American Foursquare style, with slight modifications. 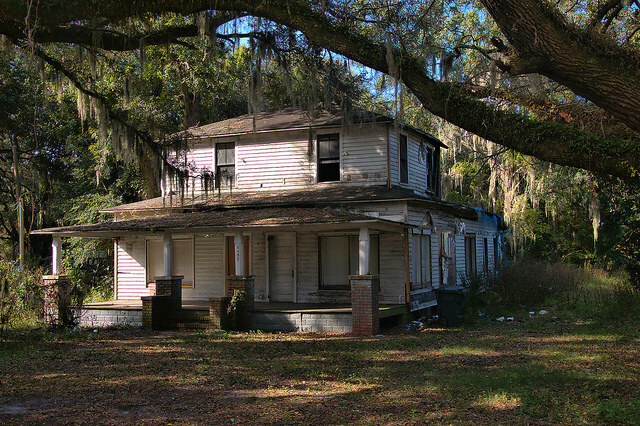 I’m sure it’s one of the oldest houses on US 17 in Glynn County. It has a certain feel to it. Very old , yes. Was it a farm house, or part of a plantation? The old Home Place is still beautiful. I’d like to feature some of your posts on my blog, The Lens and Pen. Would you be interested? Sure, Nancy. Sounds great. You can email me at wbrianbrownATgmailDOTcom. I’ll be on the road most of the day but will look forward to hearing from you. Computer problems are such a hassle. I totally understand and there’s certainly no rush. Yep. Computers are great…until they aren’t! We are also moving on April 1, so a glitch right now Murphy’s Law. Take care. I don’t see anything that would give me any idea how old this house REALLY is…though I would like to know. Did not do well with Hurricane Irma unfortunately! This house looks much like the old James Hamilton Couper home at 6784 Browntown Rd in Waynesville, GA. Have you been there? I rented it for two years in the 1990’s. It was a wonderful place to live. The Vermacular House is what I was referring to re the J. H. Couper house. Sorry! This house has some significant fire damage in one of the upstairs bedrooms; I was on the first fire engine on scene when it happened. Chris, are you related to Waver?….we went to Glynn Academy together in the 50’s. Where on Hwy 17 is this?